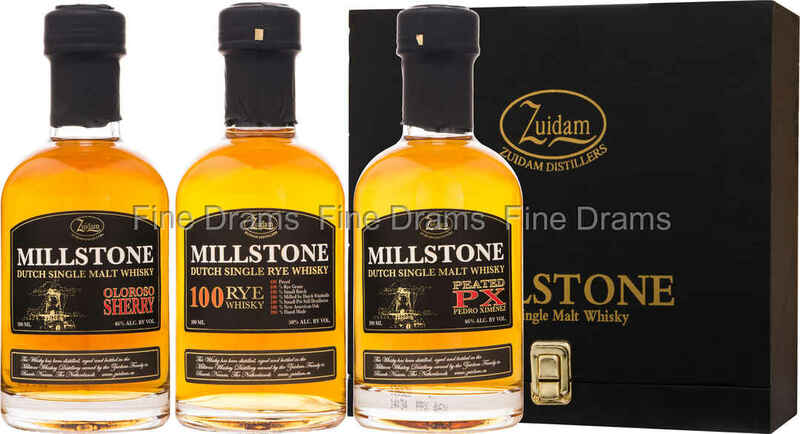 A cracking gift set from Millstone, showing exactly what the Dutch distillery is all about. This pack includes three 200ml bottlings: the distillery standard five year old single malt, a 10 year old French Oak matured offering and a 10 year old American oak matured expression. The five year old has been aged in a combination of former Bourbon barrels and Oloroso sherry casks, producing a dram of perfect balance and complexity. Drinkers can expect notes of banana, dried fruit, orchard fruit, chocolate, grassy malt and salted caramel. The 10 year old American Oak delivers flavours of coconut, almond, honeyed tropical fruits, bright vanilla, oak, woodspice – cinnamon, clove, nutmeg and anise. Whilst the 10 year old French Oak cask is more floral, with notes of honeysuckle and pot-pourri, alongside flavours with plums, cherries and dried fruit. A wonderful showcase of what Millstone can do, beautifully presented in a black wooden case, this would make an excellent gift for any world whisky fan.